If you have leftover turkey from your sumptuous Thanksgiving feast, you can make this easy, delicious, one dish meal, Turkey and Broccoli. I have made this dish forever, so it's tried and true, You can also use cooked chicken, if you don't have leftover turkey. Even if Scott and I are going to family on Thanksgiving, we cook a turkey sometime around Thanksgiving to have the leftovers. For this recipe you cook, fresh or frozen broccoli, even your leftover Brussels Sprouts in a 1-2 qt casserole casserole dish in the microwave for about 5 min. Then place chunked turkey on top of cooked broccoli. Mix I-2 cans cream of mushroom soup, depending on the size of your casserole dish, and 1/2 cup mayo or Miracle whip, in sauce pan. Heat mixture over low heat, just until blended. Stir in 1 tsp curry powder. Pour over Turkey in casserole dish. Top with grated cheese, any type. Heat in microwave, until cheese is just melted. Enjoy! Just as side note, our Sharp microwave, which was 1 1/2 old, out of warranty, died last week. It was on a shelf over under a cabinet, not over the range, It is so aggravating, that all of these appliances, or components made in China are crap, and made to be disposable. Sure, we could have taken it to a service center to be repaired, but the parts and labor would have been a lot more than a new microwave. We didn't buy a really expensive one, because we might be replacing it another year or so, Hopefully not. Have you had to replace newer appliances that died, before their time? 1. Partially cook broccoli in microwave and place in the 9X13 pan. 2. Place cut up chicken over the broccoli in the pan. 3. Heat soup, Miracle Whip, and curry powder over low heat until blended. about 30 min. or until bubbly. Miracle Whip, and curry powder over low heat until blended. 6. Sprinkle grated cheese on top and serve with rice, regular or brown rice. Since I didn't host this year, I don't have leftover turkey! But...I buy roasted chicken at the grocery each week, and this would be FANTASTIC for those!! Have a restful weekend...I sure am!! Becky, you're making me crave turkey all the more since we don't do Thanksgiving in France but boy, am I hoping for it for Christmas - just for that lovely comforting leftover dish of yours since I adore broccoli! Wendy-I have originally made this recipe with cooked chicken, so the rotisserie chicken would be great for this. I hope that you do have a restful weekend. I am "recuperating from shopping on Black Friday! Great comforting turkey leftover re-make dish to unwind for you Becky, after the Black Friday madness shopping...better you, then me! LOL Love the bargains, just would not like to stand in line for hours or to camp out, for that matter! I'm sure you found some amazing bargains, so it's well worth it! Elisabeth-thank you for your sweet words. I didn't have to stand in line or camp out at Kohls at the time that I went. Claudia-This is a yummy recipe. Hope that you got time to rest. Mmmmmm, this looks wonderful, Becky...especially with that nice layer of gooey cheese on top! 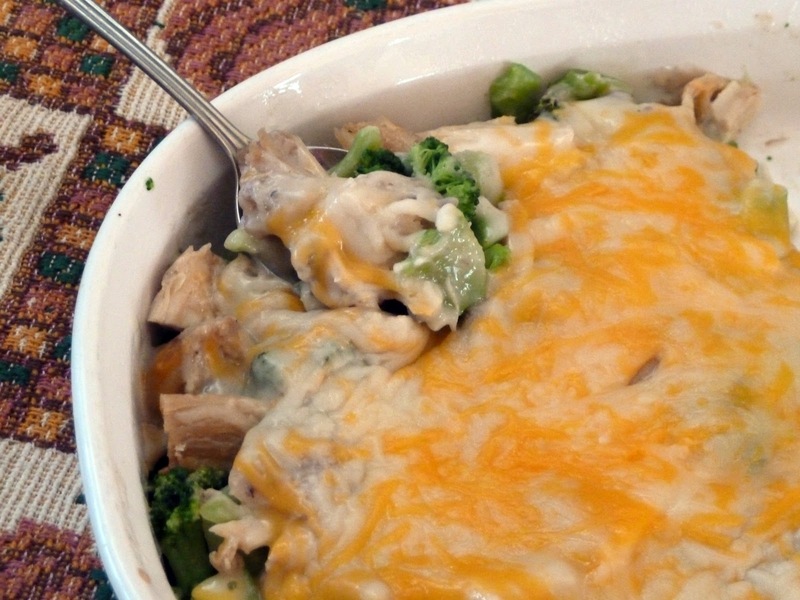 Lizzy- This is a yummy, cheesy casserole with turkey! Great use of turkey leftovers, love the melted cheese on top! I don't have any leftover turkey but I do have some chicken breasts. Anything with broccoli and cheese makes me excited! Thank you for sharing such a tempting meal with me. I hope you are having a happy start to your week! Natasha- this is a great way to use up leftovers, especially with the cheese. Monet-This recipe originally was for chicken, and I just changed the recipe to use the leftover turkey. Chicken and Broccoli was a favorite of my kids.